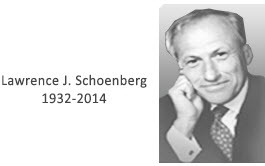 The staff of the Schoenberg Institute for Manuscript Studies honors the memory of Larry Schoenberg (C ’53 WG ’57), the institute’s co-founder, who died on May 7, 2014. As a collector and a scholar, Larry explored the transformation of knowledge as represented in manuscripts through the variations of time, translation, format, cultural exchange, scholarly argument, and practical application that his beloved books presented to him. 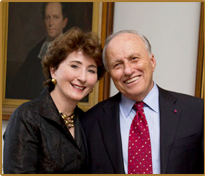 His lifelong pursuit, shared with his wife Barbara Brizdle, generated an outstanding collection of manuscripts, the Schoenberg Database of Manuscripts, the Schoenberg Center for Electronic Text & Image, and the annual Schoenberg Symposium, all under the Schoenberg Institute for Manuscript Studies. His commitment to using digital tools in manuscript studies and to making his collection freely available online has already supported the work of many scholars and will inspire more in the future. We will continue to pursue these commitments and will miss Larry’s passion for knowledge, as well as his encouragement and humor. Video: Lawrence J. Schoenberg Memorial Celebration, held June 29, 2014 at the University of Pennsylvania Libraries.